I lived in Europe for over seven years, and I've visited scores of other countries. These were wonderful experiences, but I've never found a country I like as much as my own. It's natural to love our country. Citizens all over the globe think their country is the best. 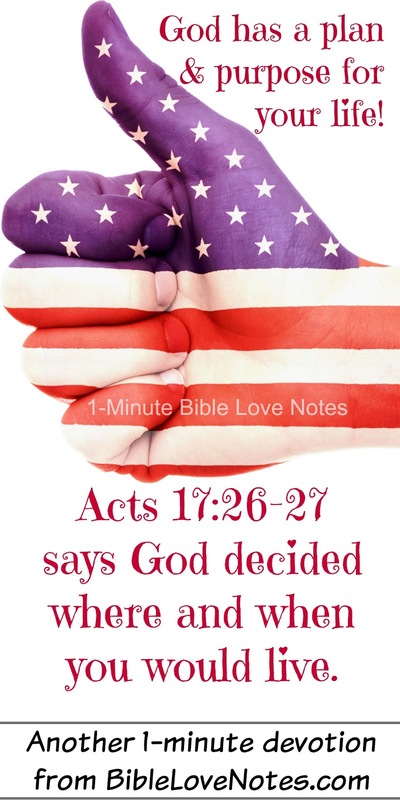 And that's good because our birth-country is part of God's plan for us. Acts 17:25-27 says, “God began by making one person, and from him came all the different people who live everywhere in the world. God decided exactly when and where they must live. God wanted them to look for him…though he is not far from any of us” (NCV). You are here for a reason! God decided when and where you would be born, which parents you'd have, your abilities and personality. You are part of His story--your life has purpose and meaning. May that thought give you joy today! Have a blessed 4th of July! 1. We often underestimate the importance of our family, our country and the specific circumstances of our lives. These passages should encourage us that God has designed the details of our lives for His purposes. Psalm 139:13-18: For you created my inmost being; you knit me together in my mother’s womb. 14 I praise you because I am fearfully and wonderfully made; your works are wonderful, I know that full well. 15 My frame was not hidden from you when I was made in the secret place, when I was woven together in the depths of the earth. 16 Your eyes saw my unformed body; all the days ordained for me were written in your book before one of them came to be. 17 How precious to me are your thoughts, God! How vast is the sum of them! 18 Were I to count them, they would outnumber the grains of sand— when I awake, I am still with you. 2. The following passages talk about our role in fulfilling God's purposes for our lives. Philippians 2:12-13: Therefore, my dear friends, as you have always obeyed—not only in my presence, but now much more in my absence—continue to work out your salvation with fear and trembling, 13 for it is God who works in you to will and to act in order to fulfill his good purpose. Ephesians 5:8-10,15-16: For you were once darkness, but now you are light in the Lord. Live as children of light 9 (for the fruit of the light consists in all goodness, righteousness and truth) 10 and find out what pleases the Lord ... 15 Be very careful, then, how you live—not as unwise but as wise, 16 making the most of every opportunity, because the days are evil.